There’s no doubt that a lot of my life revolves around this machine, before which I spend several hours a day. I’ve been riding this pony since 1992 (when I started building a Gopher presence, soon after I started work as a reference librarian at W&L), or maybe since 1989 when I started playing with HyperCard, or perhaps since 1984 when I bought my first microcomputer (a TI-Pro, still in the barn), or maybe 1979 when I started to play with SYMAP (making maps of demographic data from the Hungarian census of 1900), or maybe 1962 when I first started working with punch cards (as research assistant to Bob Textor in cross-cultural studies). At each of those junctures I had some idea of where I was heading, but the destinations kept changing as new possibilities emerged. I discover that others who are reading Eco’s Mysterious Flame of Queen Loana have established a Wiki-based annotation project for the book. At the moment I’m eagerly awaiting the imminent arrival of Dave Weinberger’s Everything is Miscellaneous: The Power of the New Digital Disorder (publishing tomorrow), listening to Weinberger’s Radio Open Source appearance, keeping an eye on Weinberger’s blog around the book, and still savoring a two-hour podcast of Weinberger’s Social Media Cluster talk of last week. This entry was posted in geekery, rumination, technology on April 30, 2007 by oook. Another bonzo post over at Language Log, this one invoking (among other things) aposiopesis and gxddbov xxkxzt pg ifmk, both of which had escaped my notice heretofore. My education continues, and seems to be picking up speed on the downhill run. Perhaps coincidentally, I’m enjoying Umberto Eco’s The Mysterious Flame of Queen Loana. This entry was posted in language on April 29, 2007 by oook. This entry was posted in Uncategorized on April 29, 2007 by oook. but I didn’t grasp its deeper significance. 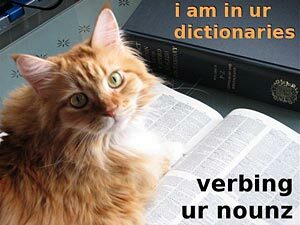 See more on the harbl meme… and a couple of hours later, LOL-Kitteh as a Second Language (LKSL-101) in Five Easy Steps, via The Lexicographer’s Rules. Whatever NEXT? This entry was posted in language, lexicon on April 25, 2007 by oook. This entry was posted in Uncategorized on April 23, 2007 by oook. This entry was posted in technology on April 22, 2007 by oook. …the notion that knowledge is dynamic, ever-circulating, breathing in and out, washing some books up to shore while washing others away to the great unbounded deep, works very well for certain of the humanities, but works only occasionally for the physical sciences. A test case: what about advances in medical knowledge? Are they part of this great sussuration of knowledge, or are we really getting somewhere? Do we really need to rethink, oh, the idea of a cell? This entry was posted in quote, video on April 22, 2007 by oook. This entry was posted in musics, video on April 22, 2007 by oook. This entry was posted in musics on April 21, 2007 by oook. Serendipity, Inversion, Idiosyncratic Categories and Junk: Tools for KM? (the) Gambia, (the) Lebanon, etc. This entry was posted in Uncategorized on April 20, 2007 by oook.